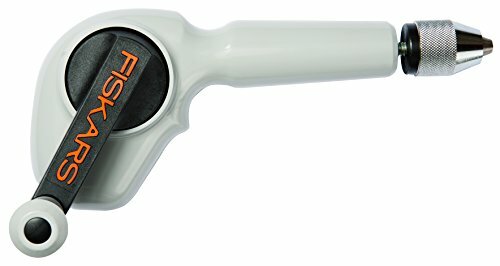 FISKARS-High quality drill is perfect for boring holes in wood, plastic, and most soft metals. The housing is made of durable ABS plastic. 4 popular drill bits-3/32", 5/32", 1/8", and 3/16" are included. Contoured handle is designed to reduce fatigue and increase comfort. Enclosed gears ensure smooth operation for maximum drilling pressure. Caution: This product was designed to easily drill through multiple layers of craft materials. Please do not use your craft mat with this drill; it will not stop a thing and you may damage your table or counter. Best work surface is an old phone book or piece of wood that is at least 1/4" thick.